Grants +2% to all Killer effects. This page last modified 2013-01-06 08:23:27.
took him down with a smn, rdm, whm, and nin. min ish he'll run outa MP then its just fair game. gotta take him down to the house by the tav zone on the south end to avoid links. It causes Intimidation to everything you fight, i use this as a THF and THF has no "* Killer" effects and ive intimdated just about everything that ive soloed with this thing on. I bought one of these for 1.7 mil and thought it would make a huge difference combined with arcana earring against undead, but I didn't really notice that much of a difference as opposed to just using arcana earring, think I'll stick with my ice shield. "It's better to be pissed off than pissed on." Arcana Killer is for against things like Demon's, Bomb's etc. you'll want "Undead Killer" for things like skele's ghosts, etc. maybe this is why it wasn't showing much of a difference. Um he said Arcana Earring, which is an earring that weakens arcana killer effect and strengthens undead killer effect. this should be in Off-Topic fourm. You posted this in wrong fourm. It has nothing to do with FFXIgeneral discussion. The OOT's official standpoint is that it doesn't belong in the OOT either. The intimidation on this shield is 1% and it can be raised by getting more chr. I've seen thfs on my server with this shield.. It is clearly made for bst/pld. It is clearly made for bst/pld. I believe Chr affects intimidation, as I have noticed a difference while putting on my Koenig pieces, I seem to intimidate way more. Edit: To really see this shield shine, get the earring that enhances the 'killer' trait of the particular mob you're fighitng. I have the Dragon Earring and the one that enhances Undead Killer. With the Undead Killer one, I own KRT bones. I can't wait to get this thing for my beast, it's gonna be awesome. I read somewhere that 6 beasts killed it, the NM doesn't sound so hard as long as you stay away from AOE etc. Lumber drops fairly often I farmed it for my pop items in Xarcabard with 68bst/thf using CC jugs. i have a picaroons and a hickory shield, i know picaroon is 100%, whats the percentage on hickory? This shield add all the possible killer trait to the user. I have been using this shield as a lvl75pld. Intimidation occur when i am fight Pot,weapon and even Suzaku. Worst nightmare of all, it also cause intimidation my party red mage who is healing me cause he wear the crisom leg . . . .
#darkxone, Posted: Aug 25 2005 at 1:17 AM, Rating: Sub-Default, (Expand Post) This shield add all the possible killer trait to the user. I have been using this shield as a lvl75pld. Intimidation occur when i am fight Pot,weapon and even Suzaku. Worst nightmare of all, it also cause intimidation my party red mage who is healing me cause he wear the crisom leg . . . .
Just food for thought, doesn't everybody "technically" have every enhancement in the game... your enhancement in that area is just "0". That's the impression I was under, and if you think about it.. it kinda makes sense. well no u dont have every killer trait. Cause when u Bst gets lol i dont know "beast killer". Bst doesnt have that ability until a certain level is reached and then at certain levels it says "beast killer" is enhanced. So no all jobs do not have all the "killer" abilities at 0 to start. Thats why its called the present. #Airith, Posted: Jul 06 2005 at 11:07 PM, Rating: Sub-Default, (Expand Post) This shield is just about as godly as they get if I may say so myself...Bst/Pld go for it get as many as you can...Run my little friends run! You do NOT need to have ability to enhance something. I use General's shield which has "Enhance Beast Killer effect". And when I fight Dhalmel in Bibiki Bay (Oh yeah, I'm a PLD) I get this "Catoblepas is intimidated by Arina's presence"... so NO, you do not need to have abilities to get this "Enhances killer effect"
It gives you ALL killer effect... with very slim chance of happening though... like 1% or so. This shield is supposed to intimidate everything. Not just monsters that fall under the "killer" categories, and this includes other players. 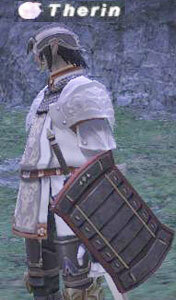 Case in point, a White Mage tried casting Protect on me while I was wearing this shield and was intimidated. for all those saying you can enhance an effect you dont have, well your wrong. and a PLD will notice it the most. any killer trait is aided by charisma. Several of the PLD shield "enhance effects" although you dont naturally have that effect. I ve see aquans and beast initmidated while using the "enhances trait" shields. I've personally tested this with other shields and on diffent mobs. "ennhance killer effects" gear DOES give you the trait. Somebody said they intimidated a Gigas and a Elemental?? There is no such thing as "Beastmen Killer" or "Elemental Killer," so... unless I'm forgetting something, I dont see how that is possible. Want a karma level like mine? Easy. Just have an opinion varying from someone elses. #ChaosMogul, Posted: Jul 09 2005 at 3:56 PM, Rating: Sub-Default, (Expand Post) Elemental aren't Arcana, so "served" right back. Oh, and I have this shield as well... I've fought craploads of Lumorians and Beastmen... not a single intimidation, where the 1/50 comment is about right on other mobs. It says it enhances it, but I think the fact that multiple non-bst people who have used it have had the effect work for them suggests that the wording is either off or that they just aren't interpreting it correctly. If it ENHANCES, then it will not add the effect. There is no way to enhance an effect that is not there. sorry you are mistaken it gives you all killer traits (this has been tested) lizards pots,hares,birds,beetles u name it, all will get intimidated. this shield sux for everyone who can wear crimson armor though , as it lowers your resistance to one of the traits, a pld using this shield will intimidate himself as much as he intimidates mobs , and so far most rmds i know who uses crimson has been intimidated by me war75 when curing or enchancing me , a godly shield for war and bst ! I can vouch for that....I tried to wake up one of our pld's and got "Altron is intimidated by PLD's presence." I was wearing Crimson hands and feet at the time. So yeah, it does add the effect to mobs and to other pc's as well. Just wondering what kind of shield this is, i.e. Tower, etc. It would be cool if a thief could equip a Tower shield. I know there are a few exceptions to the rules of jobs to equipment types, like the Platoon Spatha. So...anyone know what kind of shield this is? It ADDS ALL KILLER EFFECTS. I'm the one in the picture there. I can intimidate Weapons. I can intimidate bats. I can intimidate Gigas. It also enhances killer effects that you have. I'm about 1/10 intimidation on undead with the shield on, since it adds to my natural Paladin attribute. It sells for 4,000,000 - 5,000,000 on Fairy. Main problem with using this as Paladin is the Enmity you miss from Koenig. then why is the name edited? I can back this up, I intimidated an Aura Pot in sky while using this, and beastmaster does not get Arcana Killer. Playing on Phoenix since December 28th, 2003.